Ash, having gone from urban legend to hometown hero, discovers that he has a daughter. When Kelly witnesses a massacre with Ruby’s fingerprints all over it, she returns to warn Ash and Pablo. Right off the bat, let me just say that I have been an Evil Dead fan since the first film and beyond. Obviously I was excited when news of a show broke out, because as any Evil Dead fan will tell you, we just wanted more. A show is the PERFECT way to give us more as we get multiple episodes, equaling multiple seasons, equaling multiple hours of content to watch and enjoy. Ash vs Evil Dead is the perfect blend of the films. I’ve always felt like Evil Dead was horror, Evil Dead 2 was comedy horror, and Army of Darkness was comedy. Ash vs Evil Dead keeps the humor from Army of Darkness, but brings back the scary from the previous films. What’s great is they not only introduce Ash at a completely different time in his life years after the films, but they bring in new characters that don’t feel out of place. It all fits together nicely like a big Evil Dead puzzle. That’s not to say, however, that this isn’t just a love letter to fans. They are able to pay tribute to everything you love about Evil Dead and even bring new things to the table. This show has it all. The soundtrack itself is amazing, the chainsaw is back in action, the cabin returns, time travel, the classic, the shotgun, the deadites, the book, and oh dear god, the blood. Starz was definitely the perfect choice for this show as they not only let them do what they want, but also tell them to go even further. As if that all wasn’t enough, the writing in the show is fantastic. Bruce Campbell has definitely come a long way since the first Evil Dead, and it shows. The stories they tell are not only hilarious, but can also be intense. It’s not just the decapitations you care about, but you actually give a s*** about the characters, you actually want to see what happens next, and you even get stuff you didn’t even know you wanted. 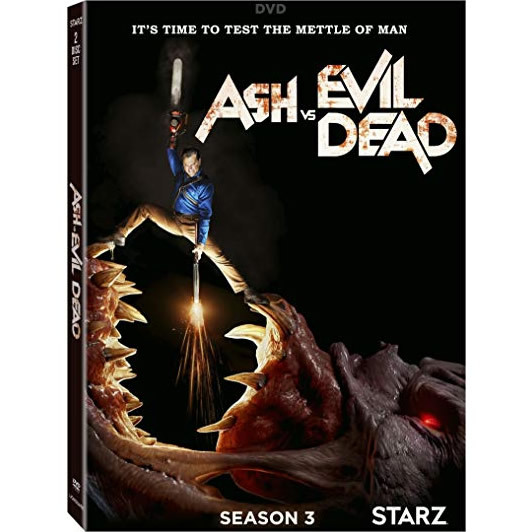 Bruce Campbell, Sam Raimi, the showrunners, the network, the writers… you can tell they care about this show. You can tell they care about the fans. They’re not just making a show to get people to shut up about another Evil Dead. Love definitely goes into the making of Ash vs Evil Dead, and it shows. I’m trying my best to write this review without any spoilers, which I’m finding difficult, so I will just end it here. If you’re reading this, please know that this show is amazing and it’s for both fans and newcomers alike. There are so many ways to see shows like this nowadays, but I actually bought and pay for a Starz subscription SPECIFICALLY so I can watch and support this show. Before there was a Sam and Dean, there was Ash, and Ash is back in business. HAIL TO THE KING, BABY! !